Last spring my Gender and Technological Change class did a project on bathrooms and gender, using our campus as a laboratory. You can read all about the rationale for the experiment here, but the short version is that we tried to look at how the built environment influences, and even enforces gender divisions, and how resources in the real world impact how people feel and express themselves in public spaces. This tied into larger class discussions about how seemingly neutral technologies create and enforce categories in society, rather than merely reflecting them. The outcome of the project was a variety of visualizations of the data the class collected–including graphs, charts, and spreadsheets. Perhaps the most impressive and useful one was the google map that drew on the class’s research. For those who might not be familiar with the abbreviated names for each campus building, an IIT campus map is available here. Two students in particular took the lead in creating this resource: Carla Kundert, who did all the meticulous work of setting up the map and transferring information it, and Cruz Tovar, who created a unified spreadsheet of all the information collected by the class that allowed the data to be easily utilized for the map. By giving information about the relative sizes and locations of men’s and women’s bathrooms, the map tries to show the inadequacy of facilities on campus for women, as well as the paucity of bathrooms designated as gender-neutral. It tries to comment on which bathrooms are easily accessible for users with mobility concerns, and also indicates which bathrooms on campus might be good targets for future conversion to gender-neutral spaces, noting which facilities have a single stall configuration. It was the class’s hope that this map could serve as a resource for current and future IIT students, and perhaps jump-start a public discussion about how IIT’s administration can meet the needs of students more effectively when it comes to this basic and essential resource. 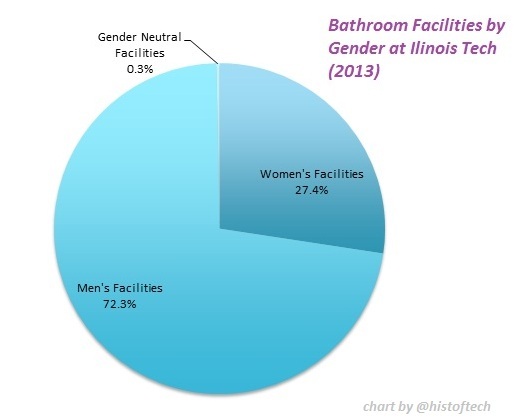 As the chart to the left shows, there are significantly fewer facilities for women than there should be based on women’s numbers in the Illinois Tech population: Though IIT still struggles to attract and retain women students and faculty, overall we are 37% women, with our undergraduate student body currently 31% women, and roughly 21% of our full-time faculty. Critically, this chart also shows the woefully tiny resources devoted to safe, gender neutral restroom spaces on campus.